As you may already know, after several years of 'silence', MLCad v3.30 was released some weeks ago. I had the opportunity to interview the creator of MLCad, Michael Lachmann and ask him some questions about this new release and about the past and the future of MLCad. The most important change in MLCad v3.30 is related to colour handling, but there are some other changes and more to come. 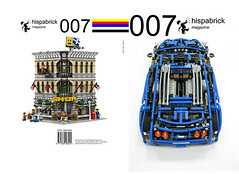 If you want to know more and would like to read the interview with Michael Lachmann, you can do so in Hispabrick Magazine 007.